The ‘MT4’ part of the name is the clue: it stands for ‘Maserati Tipo 4 Cilindri’. 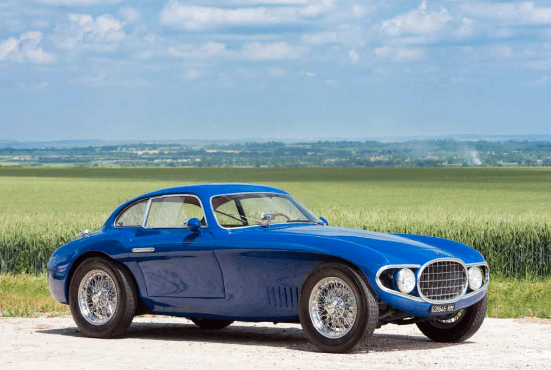 OSCA – Officine Specializzate Costruzione Automobili – was set up in 1947 by three of the Maserati brothers. Their plan was to make small racing cars, using engines based on Fiat’s 1092cc block and topped with OSCA’s own aluminium cylinder head. A new twin-cam head for 1950 raised power to an impressive 100bhp, and the company began to broaden out from barchetta bodies to berlinettas by Frua and Vignale. The latter carrozzeria was responsible for this intriguing Michelotti-styled machine with its cutaway flanks, zig-zag waistline, crisply-outined nose and minimal front overhang. It was commissioned as a one-off by Turin chemist Mario Damonte to contest the 1952 24 Hours of Le Mans, in which Damonte, partnered by Fernand Lacour, retired after 19 hours with clutch trouble. Damonte and his OSCA returned for 1953 and, with co-driver Pierre-Louis Dreyfus, scored a win in the 1100cc class. Ownership passed the following year to Maria Luisa Zamberini, a Turin resident like Damonte; from 1956 it disappeared into a private collection until moving to Japan in 1997. The present owner acquired the OSCA in 2015, and in 2016 he showed it at the Concours on the Avenue in California.